South Australian property owners can safely dispose of their mobile phones at the same time as their unwanted farm chemicals, when Agsafe’s ChemClear collection hits the road in June. The agricultural and veterinary chemical waste disposal program has teamed up with MobileMuster, the mobile industry product stewardship program, for the first collection of its kind, giving remote farmers and growers a chance to recycle mobiles and accessories. MobileMuster recycling manager, Spyro Kalos said the collaboration will make it easy for rural residents to responsibly dispose of both their mobile phones and chemicals in one convenient collection. “This is a great initiative that tackles two waste streams and gives residents an opportunity to declutter their home or work space in a safe, secure and environmentally sound way,” he said. The aim of the MobileMuster program is to keep old mobiles and accessories out of landfill and ensure they are responsibly recycled. MobileMuster accepts and recycles all brands and types of mobile phones and accessories. Everything is recycled, nothing is resold and all data is destroyed in the process. ChemClear is a waste management program that encourages farmers and other agvet chemical users to clean up their farms and chemical stores, and register unused chemicals for collection and safe disposal to ensure sound environmental practices. 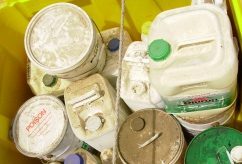 Waste holders have until 27 April to register their unwanted farm chemicals. On their scheduled delivery day they can simply bring their old mobiles and accessories along with their registered chemicals. Waste holders can book their unwanted chemicals online or by phone and registered users will be notified of collection locations and dates in their council area before the June collection. Agsafe general manager, Alison Carmichael has encouraged farmers to take an inventory before registering. “The easiest way to get organised is to make a list of all surplus and unknown chemicals, then contact ChemClear or go to our online registration portal and register them before 27 April,” Ms Carmichael said. There’s more on registration at www.chemclear.org.au or on 1800 008 182.